U6012A is the latest generation hybrid USB HDTV tuner for your laptop and PC. 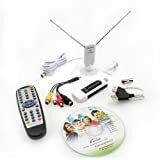 It integrates multiple tuners supporting following: Digital Cable (Clear QAM), ATSC free-over-air HDTV, traditional NTSC TV, and digital FM radio. You can enjoy the crystal clear HDTV with resolution up to 1920 × 1080i. With its bundled player software Total Media from Arcsoft, your viewing experience is like a breeze. The player software also offers personal video recorder, picture viewer, music and DVD player capabilities. A fully functioning remote control is also supported. Features: * Supports HDTV for ATSC (US/Canada/Mexico format), Analog TV for NTSC * Watch free Digital HDTV on PC * Supports up to 1920x1080i(HDTV) * Supports FM Radio * Very easy to use interface (Arcsoft's Total Media) * Support Electronic Program Guide(EPG) * Fully functioning remote control * Scheduled recording of your favorite show for later viewing * Support still image capture in BMP or JPEG format * Support multiple inputs (RCA and S-Video) for capturing external videos in DVD format (MPEG) Specifications: Input : 75 Ohm PAL-NTSC Connector Clear QAM Tuner Fully ATSC 8VSB Compliant Input Signal Level (Channel power) : 0 to -75dBm 0 to -75dBm Tuner Input Frequency Range: 48.25-863.25 Mhz FM: 88 - 108MHz External Connectors: PAL-NTSC F Type Female IF Frequency: 44MHz System Requirements: Microsoft Windows XP/Vista P4 2.4 GHz and above, or AMD equivalent 512MB RAM or above Video card 128MB for HDTV and 64MB for SDTV USB 2.0 Compatible Microsoft Direct X9.0 or above Microsoft media Player 9.0 or above UHF/VHF Antenna for ATSC Terrestrial TV (A small bonus indoor antenna is included for strong signals) or Cable TV for Clear QAM HDTV/NTSC broadcasting Package Contents: Geniatech U6012A Infrared Remote Control Mini RF to F connector converter Mini Antenna Multifunction Cable Software CD (Driver and Total Media 3.5) * One year standard manufacturer warranty. This entry was posted in Geniatech, QAM Tuners and tagged (for, and, ATSC/QAM, Cable, Desktop/Digital, Digital, HDTV, Laptop, Recorder, Tuner, USB, Video on February 6, 2013 by Moderator. 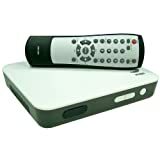 This entry was posted in QAM Tuners, Zinnet, Inc. and tagged -, (Black), (for, 320GB, and, Antenna, brite-View, Built-in, BV-980H, Clear, Digital, DVR, EPG, HD, HDD, QAM, Shifting, Supported, Time, Tuner, Use), with on February 6, 2013 by Moderator. This entry was posted in QAM Tuners, Zinwell and tagged (for, Analog, Antenna, Box, Converter, Digital, to, Tuner, TV, Use), ZAT-970A, Zinwell on February 6, 2013 by Moderator. This entry was posted in AVer Information Inc., QAM Tuners and tagged (for, Avertv, Hybrid, Kit, Max, MTVHVMXSK, Tuner, TV, Volar, Windows on February 2, 2013 by Moderator. This entry was posted in QAM Tuners, SABRENT and tagged (for, (NTSC), Alone, and, Box, in, Monitor/Projectors, Picture, Plasma, Sabrent, Stand, Tuner, TV, TV-LCDHR, TV/CRT/TFT, with on January 30, 2013 by Moderator.